JBI offers a three-year program in ministerial training. During the first year, we focus on laying a foundation for the rest of the studies, giving a broad picture of biblical studies before entering into detailed studies. 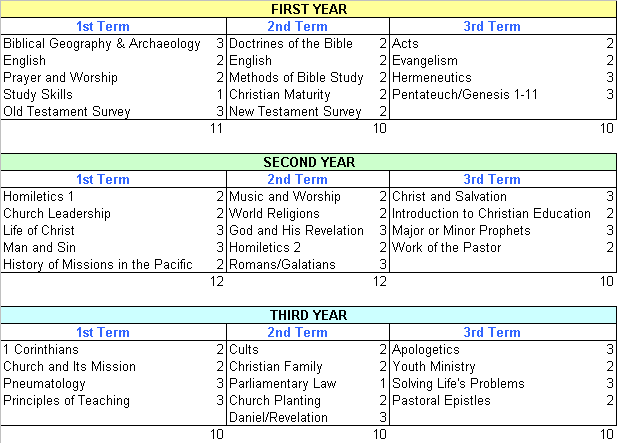 So courses like Biblical Geography and Archaeology, Old Testament Survey and New Testament Survey give a foundation for more focused courses like the Genesis through Deuteronomy (Pentateuch), Acts, Romans and other books of the Bible. A course in how to interpret the Bible (Hermeneutics) is taught during the first year so that those skills can be used for all further Bible courses. We strongly desire to see you grow spiritually as disciples of Jesus Christ during your time at JBI. Besides courses on prayer and worship and Christian maturity, it is our intention that all our courses encourage you in your walk with the Lord. Systematic theology courses show the unity of Scriptures and how different books contribute to our understanding of God, Christ, the Holy Spirit, the Scriptures, man, sin, salvation and other important doctrines of the Bible. It is vital that our understanding of God be informed by the whole of Scripture. Our purpose is to train the next generation of pastors for Vanuatu and beyond. So we train our students how to interpret the Scriptures, how to prepare expository sermons which will edify the church, how to lead the church, how to teach, how to conduct business meetings, how to evangelize, how to plant churches, how to train young people for ministry and how to help people solve life’s problems. JBI exists to serve the church and to prepare the church to fulfill its mission of making disciples of all nations. Beyond the goal of helping students in their own walk of discipleship, we aim to instill in our students a missional perspective so that the church sees and serves beyond itself. Courses in evangelism and youth ministry are only the beginning of preparation to touch the world. We will prepare you to encounter people of other world religions such as Islam and Hinduism as well as so-called "Christian" cults like Mormonism and the Jehovah’s Witnesses. An understanding of the church and its mission, the history of missions in the Pacific as well as how "to contend for the faith that was once for all delivered to the saints" (Jude 1:3) are an essential part of training for mission. The following chart gives the basic sequence and flow of courses. It should be noted that the second year and third year courses alternate so that second and third year students take the same courses together at the same time. The curriculum is a work in transition; changes may be made as needed by the school administration. It should be noted that most of our courses are taught in Bislama. We believe that an accent on English is important so that students can access literature as most of our textbooks are in English. We currently have only two courses of English instruction but are considering the possibility of expanding this aspect of the program, and a few of our courses are taught in English. We are also studying the possibility of offering courses in French. First year students will take the first year courses above. Returning second and third year students will take the courses listed under “SECOND YEAR” and "THIRD YEAR" above which alternate. During even years (2012, 2014, etc.) the second year courses are offered and all second and third years students take them together. Courses designated as “third year” courses are offered during odd years (2013, 2015, etc.). NOTE: While we want to assure continuity and stability in the curriculum, changes will be made when deemed beneficial by the administration. Tuition is 2,500 vt per credit hour, or roughly 25,000 vt per 11 week term. Students coming from Assemblies of God churches are granted a reduction of 500 vt per credit hour, bring the cost of tuition down to 2,000 vt per credit hour, or approximately 20,000 vt per term. Room and board is 9,000 vt per term. Books per term are about 10,000 vt. A full time student living on campus would need about 44,000 per term, 39,000 for Assemblies of God students. A full year would cost approximately 132,000 vt (117,000 vt for Assemblies of God students). We expect to have three studio apartments available for married couples by the beginning of the 2013 school year, 4 March 2013. The cost of these studios has not yet been determined. If you are interested, you may contact us below. We encourage all prospective students to submit their applications for admission to Joy Bible Institute by (or before) 15 October of each year. Applications will be evaluated and prospective students notified by 15 December. This will give you time to make necessary arrangements. You may download your application one here.